We review the new 2.4GHz version of the Trigmaster Plus, Aputure's transceiver-based wireless flash remote and shutter release. We were kindly given a number of Trigmaster Plus 2.4GHz units to take out and see how they operate. These new triggers are similar to the existing 433MHz versions, with a few added features, including waking up flashes from sleep mode. 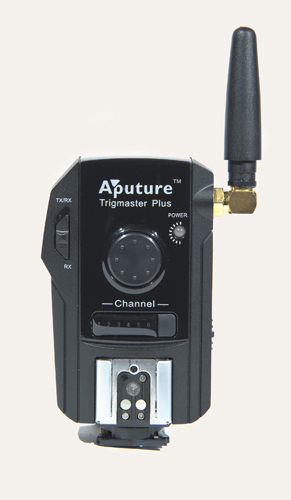 The Trigmaster Plus is a wireless transceiver made by Aputure Limited of China, who make a variety of products to help you with your photography. It is small in size when compared to the bulkier PocketWizard and Atlas transceivers. In a clear area, the stated range is 100 metres. There is a handy locking pin for Nikon flashes to lessen the chances of them slipping out. The feet are plastic and there is no locking ring, but it feels sturdy enough when attached to the hot shoe of the camera. There is a light stand mount located on the back of the unit. As it was a Nikon version I was testing, the 2.5mm to Nikon Remote Port cable for remote trigger of the camera was supplied. The On switch is located to the right side of the trigger, with the 2.5mm jack ports on the left. The front is home to the switch between receiver and transceiver mode, the test button and the channel button. You are able to attach a flash to the front with the hotshoe and mount it to a lightstand with the standard mount on the rear. When using the Trigmaster Plus as a trigger, you would set the one mounted to the camera to the TX/RX position, and the one attached to the flash as RX. The test button is not really used for firing the flash, you have to press it partly down and then press the channel button. Can get rather fiddly with holding the camera and trying to press two buttons. If the Trigmaster is set up as a remote for the camera, partly pressing the button will autofocus the lens before fully pressing, taking the shot. The Trigmaster Plus was able to sync all the way to 1/250th of a second with the D700. On the range test with a D90 and 80-200mm f2.8 lens, with the camera use in landscape position, and the aerial on the Trigmaster pointed up, I could get all the way to 130 metres. To get past this, turning the camera into portrait position and keeping the aerial in the same way it was, I could push the distance up to 200m, then no matter how the camera or trigger was used, the flash wouldn’t fire. The Trigmaster Plus 2.4GHz is in production now and will cost around the £90 mark. For this you get a reliable trigger with a multitude of functions that can cover more than enough range for most people. If you can live with having to grasp your camera in a certain way so you can press a couple of buttons for testing a flash, then keep the Trigmaster Plus in mind. Update: In Britain, the Trigmaster Plus 2.4G are around £50 a pop from UKphotodistro.